Vineyards, Grapes, Rain and good friends – This is the LIFE! Calistoga is always a great place to visit. Wineries, Mud Baths, Golf. What could be better? A few days with good friends! 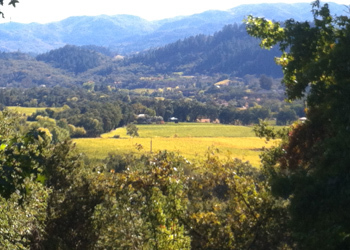 We spent the week relaxing in Calistoga and a bit of wine tasting was on the agenda. The weather wasn’t the best although we did get several campfires in and a round of golf so the rain didn’t slow us down. 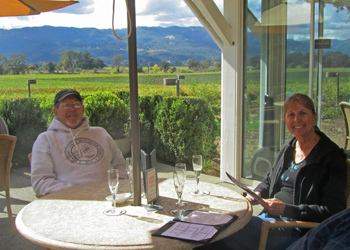 We toured Mumm Champagne Cellars, well the guys took the tour, Janet and I chose to stay on the patio and enjoy an additional taste of sparkling wine and enjoy the sunshine! Tony and Janet enjoying the patio at Mumm. We also visited Rombauer Vineyards to taste and pick up a few bottles of excellent Chardonnay! The vineyards are beautiful this time of year and we had a couple days of lots of rain but when the sun shines it is so beautiful! We spent a lot of time talking and catching up from the past year and some great card games and then of course we watched the GIANTS win the first two of their 4 games to become World Champions again! Posted in California | Comments Off on Vineyards, Grapes, Rain and good friends – This is the LIFE! I am getting a workout raking, smoothing, digging and adding dirt to the backyard in hopes that we can get the lawn growing once again. Then there is the painting of all the doorways and doors inside the house! I thought I might join a gym but then again this is pretty rewarding as we watch a house become a home. The girls are totally moved in and had their first party this past weekend. 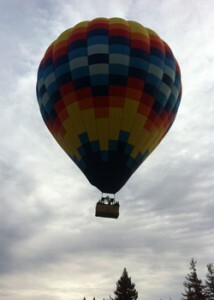 We missed it as we were headed to Calistoga for a few days. 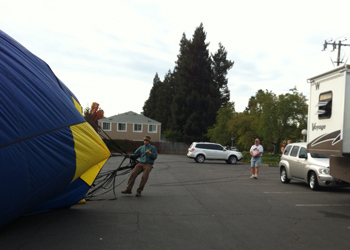 I met Paul in Napa on Friday evening where we spent two nights at the local Elks lodge in the heart of wine country. 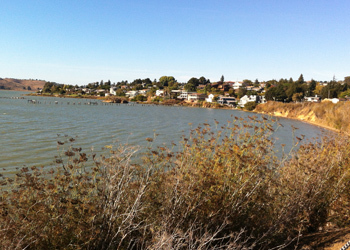 On Saturday we took a drive to the Vallejo waterfront and some driving around an area that I lived in for a couple of years as a child. 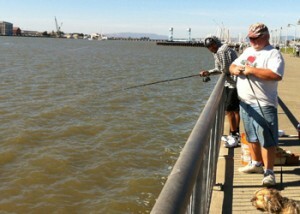 Chatting with a local fisherman doesn’t keep Paul’s attention for long! Vallejo was home to Mare Island Naval Shipyard until it closed in 1996. According to the website their are National Landmarks but on the day we drove through we only saw abandoned buildings, lots of old equipment and a golf course with an amazing view of San Pablo Bay. A view of what is left of Mare Island. 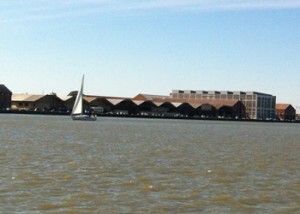 Lots of sailboats along the waterfront! We continued along the waterfront to Benicia, a quaint little town on the Bay that was the capitol of California for 13 months in 1854. The capitol building is a State Park and you can tour both the Senate room and the Assembly room. It is the only pre-Sacramento capitol left! A very cool building but no running water! 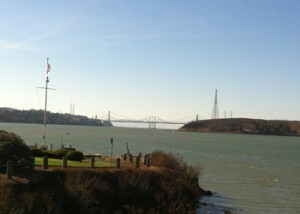 A beautiful day and a nice drive! Sunday morning we woke up to a familiar sound! The burners of a hot air balloon! Always fun to watch! The view from my bedroom window at 8 am! They landed right outside our door and Paul was out the door and ready to help! You can see how close they were to our home. It was a lot of fun watching all the paying (12) riders watch in amazement the pilot land within feet of our rig and back it up so that the envelope could be deflated without touching our vehicle. Posted in California | Comments Off on I need a BREAK!